Ana & Philippe: Uma Cerveja por favor..Sagres or Super Bock? Uma Cerveja por favor..Sagres or Super Bock? 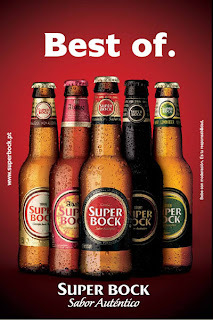 If you consider of drinking a beer in Portugal, it is good to know that Sagres and Super Bock are the two most important brands of beer in Portugal, and you could consider them the Portugese lookalikes of "Jupiler" and "Maes". Sagres, which was founded in 1940, name to a city in Algarve, is often considered as "Lisbon" beer, compared to Super Bock, which is considered as "Porto" Beer. For a long time Sagres was the dominant beer, but in recent years, it has been passed by Super Bock, by a market positioning focussed on youngsters and now has a 42% market share, while Sagres branding remains more "old fashionned". Six years ago, when I visited for the first time Portugal, these two beers, were the main beers you could find in Portugal, but in recent years, both Sagres and Super Bock have extended their product range, and I would invite you to taste also the "Sagres Bohemian" and the "Super Bock Abadia", in some way similar to our "Leffe Blonde"...I leave it up to you to choose between the two brands..... I stick to the Belgian Duvel! Saúde!/cheers!